I’m sure many of you have heard of the hormone cortisol. Commonly known as our “stress hormone,” cortisol comes to the rescue at any sign of threat. Heightening our senses, increasing blood flow in the body, and amping up our endurance. It also helps increase inflammation in the body to protect us from infection. The problem is, the majority of us are triggering our cortisol response on the REGULAR. This is due to the fact that our body doesn’t really know the difference between an actual threat (running from danger) or a perceived threat (reading a stressful work email). Our body reacts the EXACT same way. Which is why it is so unhelpful to be feeling totally anxious, sweating, and feeling the need to RUN when you’re just stuck at work (for example). Your body is saying "RUN AWAY!” but you don’t have anywhere to go. All of that extra cortisol and adrenaline in your body has nowhere to get burned off. Chronic mental, emotional, and physical stress keeps our cortisol response on HIGH all the time. Just imagine the work load on your body when you’re constantly in this heightened state of being! In addition to stress, food allergies and sensitivities (ex. gluten, dairy, soy…) as well as over-exercising and dieting, has the SAME affect on the body. These extremes cause extreme stress on our nervous system, which you may have guessed, ramps up our cortisol production. The cycle continues! how do you know if you might have high cortisol? Always feeling tired, but not being able to sleep. I remember during my worst days with anxiety and my health … I was dealing with almost ALL of these symptoms. Looking back, I was SO stressed that my body was just trying it’s best to help me out. By the overproduction of cortisol. In relationship to high cortisol, we often see another very common imbalance .. low progesterone. The reason we see these two imbalances together is because cortisol blocks our body’s progesterone receptors. Meaning, when there is too much cortisol in our system, our body literally struggles to MAKE progesterone! And, when progesterone can already be low for so many reasons (too much estrogen for example), this causes QUITE the problem. But, first things first… what is progesterone? You may recognize this hormone as it relates to the second half of your menstrual cycle. Progesterone is produced by the corpus luteum after ovulation and is crucial for helping to support early pregnancy. It is also our “feel good” hormone, helping us feel balanced, relaxed, and grounded. 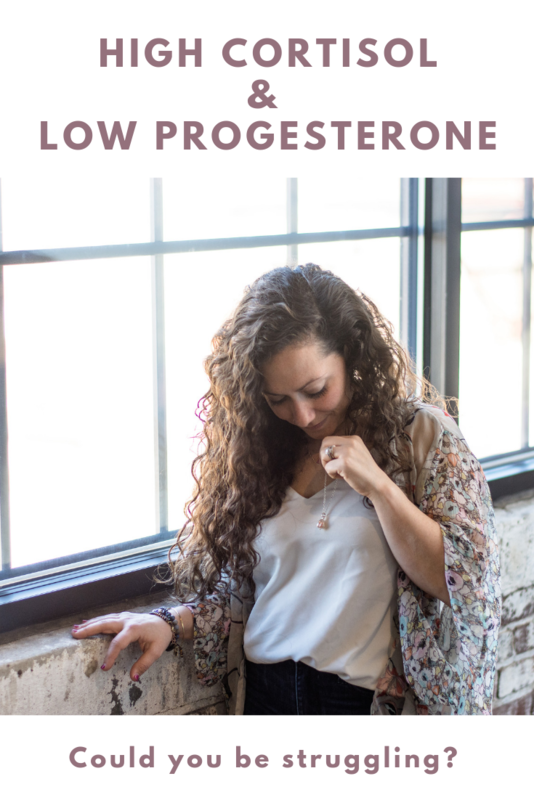 There are many reasons why progesterone levels might be low, but a few of the common causes include longterm stress (of course), synthetic estrogens and xenoestrogens, and a lack of ovulation ( very common with birth control use). how do you know if you might have low progesterone? Breakthrough bleeding or spotting during the second half of your period. Dark or black blood or clotting right before your period. A heavy flow… especially the first coupe of days. To be honest, low progesterone symptoms are still something I struggle with… although they have been MUCH better the past few months. A combination of reducing my stress and testing out a few other healing methods have GREATLY helped. How can you start healing and bringing balance back to the body? Yeah, I know… are you sick of me saying that yet? I will be the FIRST to say, I know what it feels like to have chronic stress control your entire life. My chronic stress turned into uncontrollable anxiety that ultimately lead me down this path of healing. But, I promise you, you CAN. It takes working on the mind, shifting your awareness, and implementing stress reduction techniques on a weekly basis. I can’t rave about this healing technique ENOUGH! Going to acupuncture twice a month has really transformed by body. Not only has acupuncture calmed my stress response, but it truly has helped balance my hormones more than any other therapy I have tried. Of course, going to acupuncture has been paired with eating nutritious foods for my body, proper movement, stress reduction … and the works. I created a 6-week online course, Empowered Mind, Empowered Body, to get you started in the right direction. This course will provide you with the basics for reducing your stress and balancing your hormones once and for all. There is SO much information packed into the 6-weeks including: video lectures, worksheets/journal prompts, healthy cheat sheets, meditation and yoga videos, podcast interviews, and MORE. The course is evergreen, so you can purchase it standalone at anytime, but I also offer 6-weeks of group coaching a few times a year as well. But, don’t just take it from me. Learn all about the course and hear from my past clients to see if it is the right fit for you! Always here to help you anyway I can. I have been right there with you when it comes to hormone imbalance. Finding the right support is a MUST. You can reach out to me any time, as always, babes!